The Ocean Gallery Resort is “the best address on the beach”, unmatched in size, beauty and amenities by any other complex in this area. Located on beautiful and quiet Anastasia Island, it resides on forty-two acres of beautifully landscaped lawns and gardens. Buildings and grounds are meticulously maintained. Half the units are unrented private homes, many with decorative gardens planted and maintained by the proud residents. Two beautiful boardwalks with attached gazebos offer direct access from the resort across the dunes - lined with sea oats and wildflowers - to miles of white sand ocean beach. With 24-hour guarded entry, your security and privacy are assured. 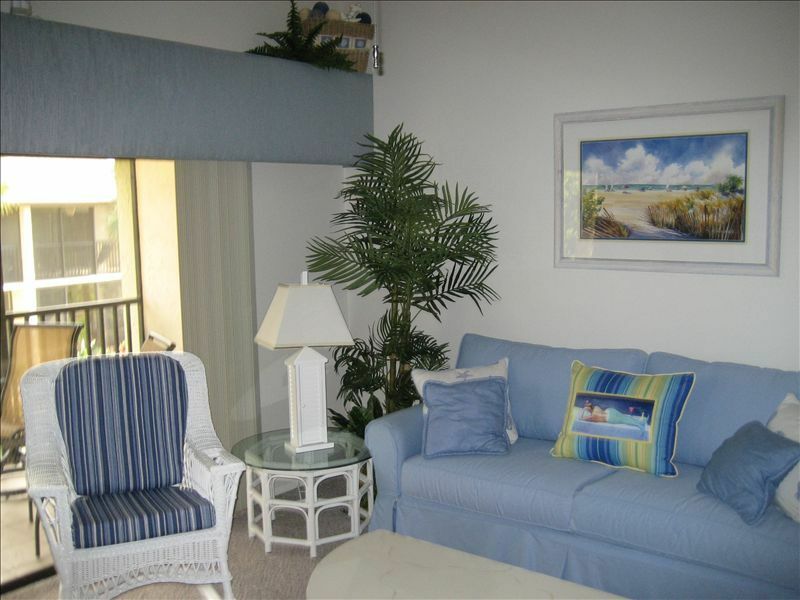 Your vacation home at The Ocean Gallery is fully furnished. Extensive renovations include new furniture, appliances and lighting, serene “coastal” decor. Adjoining the large living room with cathedral ceiling, the screened patio overlooks a lagoon, with fountain and waterfall. The master bedroom suite, with king-size bed, includes a vanity and dressing area, plus adjoining full bathroom. The second bedroom in the loft has a king bed and a private bathroom. Ample storage space, upstairs and down. Both bedrooms have desks, with lighting and desktop electrical outlets, for your computers, cellphone chargers, etc. Three wide-screen HD cable tvs (two with DVD players, one internet-connected) and wireless internet are included. Unusual extras: 45 classic dvd movies; stereo with ipod dock; beach chairs and umbrellas; games; and a library of novels and a variety of other books. The clubhouse is just steps away, where you will find a 100-foot heated indoor-outdoor pool, available year-round; also a large hot tub, 2 saunas, gym, table tennis, restrooms and showers. Surrounding the pool are chaises for sun bathing, plus tables and chairs. A second pool is available in warm weather, with hot tub, seating and restrooms. Across from the clubhouse are four lighted tennis courts, two lighted racquetball courts, plus shuffleboard, and basketball. Child friendly: children love the pools and the beach, and there is also an onsite playground. Just want to relax? From your rocker on the patio, enjoy the view of the lagoon and listen to the fountain. Stroll around the grounds in the evening, or out to the beach. Watch for whales from the gazebos or the beach. Other wildlife is visible too, in the dunes as you cross the boardwalk to the beach, plus many species of birds, including a beautiful white egret that visits the lagoon. There are excellent restaurants nearby, plus take-out and delivery services. Golfers have discounted access to many nearby courses. Parasailing, jet skiing, deep sea fishing, boating, ecotours and bicycle rentals are also readily available nearby. Colorful farmers-and-crafts markets are held weekly, with free entertainment from local musicians. Concerts and other cultural events occur regularly at venues in St. Augustine and other nearby cities. To discover St. Augustine’s Maritime Past, visit the Lighthouse and Museum; climb 219 steps to the top of the tower for a breathtaking panoramic view of the area. Directly across from the Lighthouse is St. Augustine Alligator Farm - Zoological Park. See hundreds of rare and exotic birds, mammals, reptiles and 23 species of crocodilians. Across the “Bridge of Lions” is “oldest city” St. Augustine. Tour historic homes, the iconic Castillo de San Marcos, and the grand, gilded-age hotels and churches of Henry Flagler. Next to the cathedral is St. George street, lined with restaurants and other popular attractions. Nearby are art galleries, boutiques, night clubs, and much more. Highway 1, at the edge of town, is lined with shopping centers that include every major retailer, plus many other stores and restaurants. A short drive north and west are two giant outlet malls, with bargains on dozens of national brands. Within easy driving distance are several state parks, and Florida destinations such as Amelia Island Plantation, World Golf Village, Daytona Beach, plus Disney World, Epcot Center, and the many other Orlando attractions. Golfers have discounted access to nearby courses. Parasailing, jet skiing, deep sea fishing, boating, ecotours and bicycle rentals are also readily available nearby. Historic St. Augustine is minutes away; Disney World, the Space Center, and other regional attractions in easy driving distance. Less than 5 minute walk to beach and the beach was large and uncrowded. Loved sitting on the screened in porch looking at the lagoon. John provides beach chairs which was great. The price of the unit was the deciding factor for us to choose this and it was definitely a great value. The kitchen had everything you might need and beds were comfy. The drive to St. Augustine and other sites was less than 10 miles so that was perfect. Definitely recommend. Clean condo, great location, nice resort amenities! Nice condo that was clean and convenient. Short walk to the beach! John was very attentive to make sure our needs were met. Would stay there again! Our place was clean and located near everything. We enjoyed our stay and will return. Great place - Great Host! John was an excellent host, very responsive and helpful. His place is ideally located in the complex, well equipped and nicely appointed...an easy walk to the beach, not far from great places to eat. We thoroughly enjoyed our stay here and will be back. Overall we enjoyed our stay. Condo was nice and the heated indoor/outdoor pool was very nice. Short drive to town and plenty of restaurants around. Only problem we encountered was the U Verse signal for the TV was constantly being dropped and the Wi Fi was in and out all the time as well. Condo was clean and screened in balcony was nice for coffee in the morning. I would stay here again. John contacted us when we got there to make sure everything was ok. He was easy to work with and contact. Nice owner. We had a very nice week at your condo in St. Augustine. Your condominium is very lovely. We especially enjoyed the lanai and the beautiful tropical view from there, the long walks and bike rides on the beaches directly from the Ocean Gallery property, the many pools on site and touring the town of St. Augustine and discovering its deep history which we found especially interesting. We have many wonderful memories to take home with us, and we hope to rent from you again some day. Golf: Marsh Creek Country Club nearby. World Golf Village and Players Club in easy driving distance. Many other gold courses in area. * Week is Saturday to Saturday. Check-in 4pm, check-out 10am.